Have you ever said, “I will never do that.”? Well, this time last year, I said those exact words to my father after he finished a 50-mile trail run. He had done a few 50K runs (31 miles) and that was his first 50 miler. While I was impressed with my dad and his accomplishment, there was just no way I would ever tackle that challenge. Fast forward one year and I sit here blogging about this past weekend where I ran a 50-mile trail run with my father and brother. 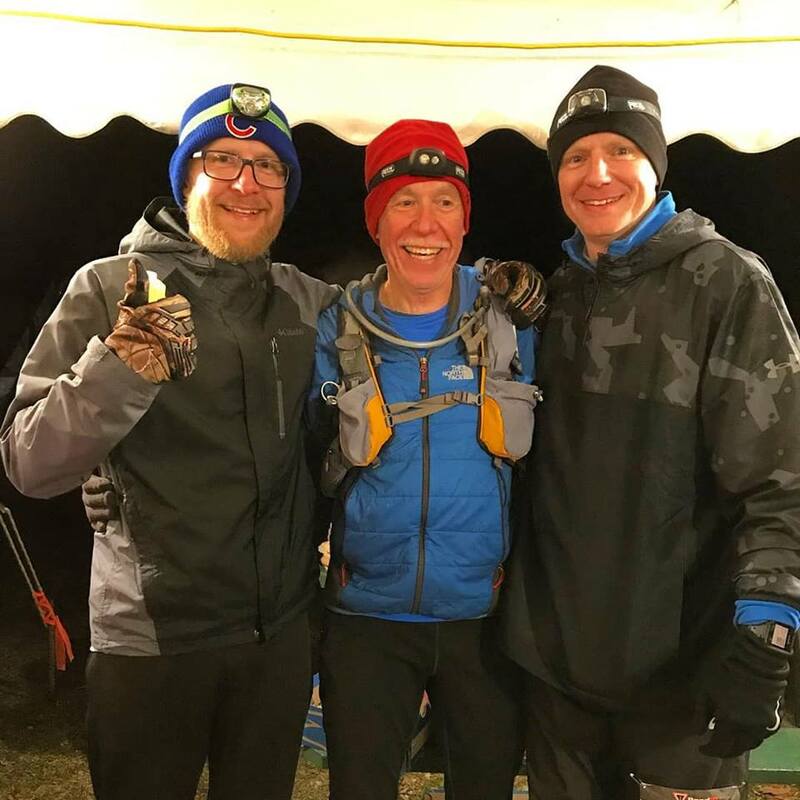 Yes, I ran a 50-mile race with my 60-year-old father and my older brother. We earned the belt buckle. There are so many aspects of the training and the run itself that I want to share and reflect upon. I am aware most people have already given up reading this post given that they are not runners. I am also aware that even some runners will stop reading because running 50 miles at once seen silly and borderline dumb. I know, I share those same feelings even after having run that distance myself. However, I still want to put into words what the experience has meant to me personally and I will attempt to make some connections to my work as an educator. Yes, this should be a no-brainer. Over the course of three months, I put in roughly 480 miles of training which included six runs of 18 miles or more and culminated in a 31-mile training run two weeks before the 50-mile race. In addition, I took on cross-training in a boot camp class to strengthen my core, legs and upper body. It goes without saying, that I could not have completed the 50-mile race without training. I relied heavily on my father who had trained for this distance before as well as my boot camp trainer who is an expert in overall fitness. To bring this into a school setting, training is key to everything we do. Our students can not be expected to perform without proper training or instruction. Obviously, this is true with coaches and athletes but same is true for teachers and learners. Our students can not be expected to perform at high levels without being trained on how to do so. We as educators are the experts with experience who can provide the training plans for students who want to achieve greatness in school and in life. During the nearly 15 hours we were running, jogging, climbing, and power walking we set small goals for ourselves. “Let’s run to the next hill and then walk up the hill.” “Let’s walk while we eat some PB&J and then jog the last mile to our checkpoint.” Throughout our 50 mile journey, we constantly set small goals that resulted in completing the “big” goal of the 50 miles. The small goal setting allowed us to focus on manageable milestones and not be overwhelmed with the big picture. I think this is so important from a mindset standpoint for kids and teachers. Too often we set lofty goals for huge projects that are daunting and too much to take in. Instead, we should be focusing on small attainable and short-term goals that lead us towards the bigger picture. This was without a doubt the best part of running this race with my dad and my brother. Yes, the training was tough and for me was done on my own. Many days I got up at 4am to run my 8 miles and doubted if I really wanted to keep training for this insane race. However, the moments on the trail with my dad and brother will be moments I treasure and carry with me for a lifetime. Many of the conversations and talks on the trail are for me alone and will not be shared. Yet, walking across the finish line arm in arm with my dad and brother is a moment I will never forget. The emotion and feelings that come with completing such a race are intense on their own, but doing it with family takes it to a level that can’t be put into words. Yes, I was exhausted, in pain, and cursing every hill we climbed. Yet I will always look back on those miles with fondness as it was a bonding experience I think few people will ever experience. I think in our schools we spend so much time focused on the “training” and the “race” that we lose sight of the important moments. Rather than spend time getting to know a kid and connecting with them as a person, we obsess over their reading or math scores. Instead of enjoying moments of joy and celebration, we are often focused on getting our curriculum covered and meeting our deadlines. Too much of school is focused on the mechanics and game of education. I feel we need far more moments where we celebrate the emotions of accomplishments, failures and progress.